The NEC 1091060 is an integrated Voicemail System specifically designed for the DSX Phone System. IntraMail is available as a 2 port/8 hour system up to a larger 8 port 32 hour system. The IntraMail Automated Attendant includes the call answering features you demand such as dial access to extensions, unique day, night, and holiday answering, the ability for multiple companies to share the same IntraMail, and the capability to dial employees by entering their names instead of extension numbers. The 1091060 IntraMail also provides full Auto Attendant features, Multiple Company Greetings, Flexible Answer Schedules, Fax detection, Answering Machine Emulation, Conversation record and many other popular voicemail features that let you get the most of your communications dollar. 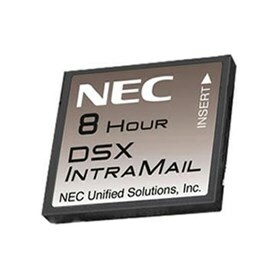 The NEC 1091060 has many exciting features for users of all types. The NEC 1091060 is sold as a Brand New Unopened Item.